The "Lost Engines of Roanoke" have gone to new homes in preservation, and not even the rails remain at the former Virginia Scrap Iron & Metal yard where they sat for nearly six decades. Twelve years before her eventual rescue, Norfolk & Western 1118 looked for all the world like a lost engine engine abandoned in the Amazon jungle, August 10, 1997. The locomotive is now being restored by the Roanoke Chapter, NRHS. The Lost Engines of Roanoke website was launched in 1997 as a call to action to save four little-known survivors of the steam era. 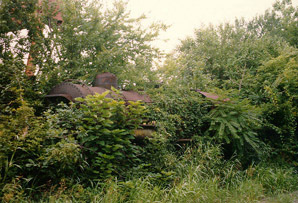 Hidden among the creepers at the Virginia Scrap Iron and Metal Co. yard on South Jefferson Street in Roanoke, Virginia, were four steam engines that time forgot. Norfolk & Western locomotives 917, 1118, 1134, and 1151 had been sold for scrap in 1950, at which time the N&W was still building new steam locomotives and had yet to order a single diesel. For nearly sixty years they awaited their fate, later accompanied by vintage Baldwin diesels Chesapeake Western 662 and 663 among other rolling stock. Today, these "lost engines" are lost no more, with all of the locomotives and rolling stock from the Roanoke scrapyard having found new homes in preservation. Although they are saved from scrap, the process of transforming them from rusting scrapyard hulks into lovingly restored museum pieces is ongoing. This website will continue to support these restoration efforts, and to tell the remarkable story of the "Lost Engines" of Roanoke, along with other similar tales of scrapyard survival from around the country. Web site by Richard Jenkins. The restoration of Baldwin diesel no. 662 has been completed by the Roanoke Chapter, NRHS. The locomotive was delivered to her new home at the Virginia Museum of Transportation on July 5th, with an unveiling and dedication ceremony on the 7th. Although she was not restored to operation, the engine received a very thorough cosmetic restoration and looks absolutely stunning. Congrats to the Roanoke Chapter for a job well done! The three sections (boiler, frame/running gear, and cab) of Norfolk & Western 1134 arrived at her new home at the Railroad Museum of Virginia in Portsmouth over the weekend of May 15-16, joining the restored 16,000-gallon tender from the Roanoke scrapyard, along with several other pieces of rolling stock in the RRMoV collection. Reassembly of the locomotive was completed on Monday the 17th. View older news updates here.